Majors Home Improvement is proud to install TEMO pergolas for homeowners in Milton, Florida, and all neighboring communities. Adding a pergola to your backyard can enhance its aesthetic and provides an area of partial shade, where you and your family can escape from direct sunlight and enjoy your outside time more comfortably. We install pergolas in a variety of styles, including free standing and attached, and our design experts will be happy to discuss your options to help you select the best design for your home. A professional and efficient installation – Our installation team is factory trained and you can expect your new pergola to be put in correctly the first time around. Respectful service – We provide Red Carpet Service for our customers, ensuring each person receives top-notch treatment. This includes silencing cell phones, keeping a clean worksite, being mindful of any plants or animals while working, and more. A warranty – We have faith in the quality of the pergolas we install, which is why we are pleased to safeguard your investment with a warranty. 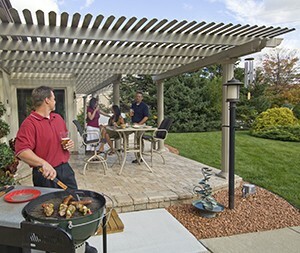 Our pergolas are incredibly durable and long lasting. They are constructed of extruded aluminum, a material that outperforms roll-form aluminum, vinyl, and wood. They also feature a unique curved lattice roof that offers exceptional sun protection. Furthermore, they come in a low-maintenance electrostatic finish that will maintain its like-new appearance for years without cracking, warping, or peeling. There’s no reason to look anywhere else for pergolas in the Milton, FL, area. Contact Majors Home Improvement today to schedule your complimentary consultation.